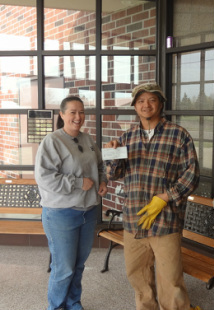 Mr. Banh recieving the generous check from ACE. Monetary and equipment donations for this project would be greatly appreciated, for the garden receives no school funding. The money would go to seeds, books, tools, edible plants (raspberry, strawberry,etc. ), rain-barrel parts, hoses, landscape fabrics, and treated wood for the rain barrel stands and raised beds. Rhinelander Agricultural Research Station: Gave seed potatoes, most went to Feed the People in Prentice Program in the Prentice Area. Smithsonian Institute National Zoo: Kirsten won $1000 grant towards her gold project for Girl Scouts with rain barrels.